Hatful of Rain are an Appalachian-influenced British folk/roots quartet based in East Sussex, playing original material with a strong traditional feel. 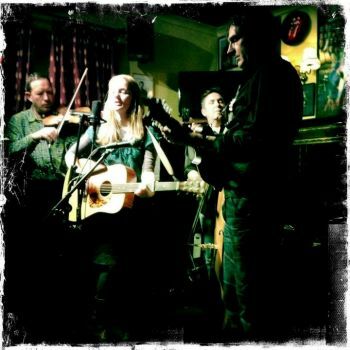 Comprising Chloe Overton (lead vocals, guitar & mandolin), Phil Jones (upright bass, clawhammer banjo, vocals), Fred Gregory (mandolin, guitar, vocals) and James Shenton (fiddle) they combine Bluegrass, Americana and ‘old time’ elements, comprising both traditional and original material. With the addition of Davies and Shenton the ‘Chloe Overton Project’ has gathered pace. These two fine musicians have added a rich instrumental dimension to the music – Fred’s guitar and mandolin have long been admired since his time with ‘Porchlight Smoker’ while James has an impeccable pedigree, both as a violinist with the Balanescu Quartet and a sometime member of The Crawfish Scrapers string band. Phil Jones (bass and banjo) is the band’s bantering front man but the eye nor the ear never wander far from Chloe’s compelling onstage presence. Her soulful yet winsome vocal style bring out the best of the bluegrass and country repertoire but it is her own captivating songs that linger in the memory.